If filling blocks of free time as you choose sounds exciting, if pulling out maps of the world stirs wanderlust, or if pursuing a hobby brings a smile to your face, take heart. You can retire early to spend your time as you want. We did! Since retiring almost three decades ago, we have visited dozens of countries, played tennis worldwide, and taken Thai cooking courses. In a small town in Mexico, we taught English, built tennis courts, and imported a basketball scoreboard. We have hiked in Australia, and climbed a volcano in Guatemala, explored many ruins in Mexico, biked and bussed in Vietnam, trekked in New Zealand, scuba dived in the Caribbean, and made many lifetime friends along the way. Because of our lifestyle, and the freedom to design how we spend our time, we have also been fortunate enough to provide end-of-life care for our parents. No paycheck could have bought any of this, nor given us this gratification. What does it take to retire early? Here's how we did it. When we excluded the expenses of working (work clothes, restaurant lunches, travel expenses, parking, dry cleaning), the expenses of maintaining a large house (gardener, house repairs, cleaning service), and the cost of stress releasers like high-priced vacations, shopping sprees, and large parties, we found we could live on $20,000 (in 1990 dollars) a year. Recently, we did an update on our annual spending and learned that it really hasn't changed that much over these two-plus decades that we have been retired. We choose to be heavily invested in equities using Index ETFs, and we follow a seasonal timing system in our IRA’s. Our net worth today is higher than when we retired, after expenses and inflation. 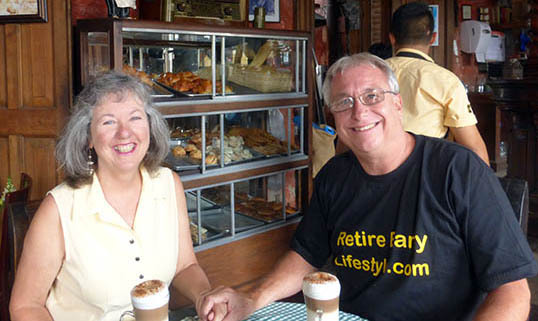 We made the decision to take social security at 62 and between that and dividends we easily cover our expenses. Continuing to track our spending we know what percentage of our net worth we are spending at any time in the year. This allows us to make adjustments if necessary quickly and not months or years later. How do we travel to exotic locations on roughly $2000 per month? We go someplace interesting and rent a furnished apartment or stay in an inexpensive hotel. Sometimes we house sit. Then we have fun shopping at neighborhood food stores, meeting the locals, trying their products, and learning where the bargains are, making a game of it. Popular guidebooks are excellent sources of information, including hotels and things to do, most with prices quoted. The longer you stay, the more you'll be able to spread out your expenses, and soon you'll find you're spending the same or less than when you were at home. For example, in Australia and New Zealand, our daily average was a whopping $80 to $100 for three months. We then balanced that by staying in Thailand for three to four months, spending just $35 a day. This averages out to be $63 a day, or $23,000 per year. And these figures include all transportation, health care, great Australian wines, lamb, brie, apartment rentals, and Thai massages. Part of our pre-retirement program was to list all the things we wanted to do and learn, the places we wanted to visit, the books we wanted to read, and so on. This list is very important. If and when boredom strikes, or if you wonder why you took this leap, take that list out and remind yourself why you wanted to retire. "Oh yes, I wanted to learn how to play tennis." "I wanted to bike across Europe." "I wanted to see South America." "I wanted to write a cookbook." This gives you the impetus to overcome inertia and move forward. Some have said they admire what we are doing, but they think it is too risky for them. We say that life is a risk. There are no guarantees about anything: health, marriage, investments, weather, and tragedy. Since we retired, we have survived the bear market of 2000, The Great Recession, the first Gulf War, a couple of medical emergencies and some funny traveling debacles. We say, if you want a guarantee, buy a Sears battery. But today, even Sears might not be a guarantee! Risk has a price, and so does security. Why not live the life of your dreams? Do the mental and physical examination, take the leap of faith, and perhaps we will meet on this road less traveled.